I’m not normally a huge fan of cocktails; I’d rather have a simple beer or wine than some of the more ‘imaginative’ drinks that some bars come up with (beer cocktails, particularly, bemuse me beyond belief). However, when the folks at The Forge & Foundry down in Camden invited Pete Drinks to visit they tempted us with talk of Espresso Martinis. Coffee and booze, as we’ve already established, can be an excellent combination. The Forge & Foundry is actually two venues in one – The Foundry is their restaurant and bar, while The Forge is a small music and and performance venue in the same building providing an impressively diverse range of events. 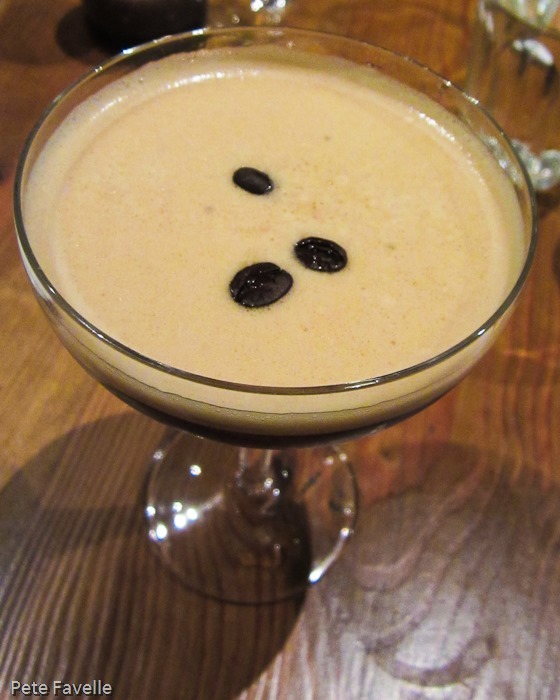 This is their Espresso Martini, looking like a rather scarily large espresso with a rich crema and some extra beans to top it off. And I’m happy to say it’s a seriously coffee-y drink, with Kahlua and a fresh espresso contributing to a rich, bitter coffee which balances perfectly against the strong vodka kick. The coffee comes from the Camden Coffee Shop, a fantastic looking old-fashioned coffee roasters a couple of doors down from the restaurant. George, the owner there, roasts his beans on the premises and produces a unique blend of Brazilian coffee for the Forge & Foundry. Sadly the shop has been closed every time I’ve been in the area; but I hope to visit when they’re open soon. We sampled some of their other cocktails too – Kavey was a big fan of the Cherry Drop cocktail of the month – and both their alcoholic and non-alcoholic offerings are well balanced, richly flavoured without any component becoming dominant. Combined with some good food, interesting performances and an easy walk from Camden Town tube, not to mention some delicious coffee, it’s hard to imagine that we wont be back for another martini! I love coffe and I used to enjoy its flavor mixed Amaretto (liquor made of almonds). But this idea seems to me like another level to taste coffee like martini. I clap this idea, let me taste it and I’ll tell everyone about this original blog. Greetings.